(CNN) - Leon Gersten could not bear to watch “Schindler’s List,” the movie about Czech industrialist Oskar Schindler who saved 1,200 Jews from Nazi extermination camps. It was too painful for the Holocaust survivor, too close to reality. But now, almost 70 years after his village in Poland was liberated by the Soviet army, Gersten is meeting the man who is the Oskar Schindler of his own life: Czeslaw Polziec. Like Schindler, Polziec is Catholic. His family secretly sheltered Gersten in rural Poland for two years during World War II. As though such a reunion between survivor and rescuer were not emotional enough, this one is taking place Wednesday on the eve of Hanukkah, which coincides this year with Thanksgiving. Two celebrations of gratitude. 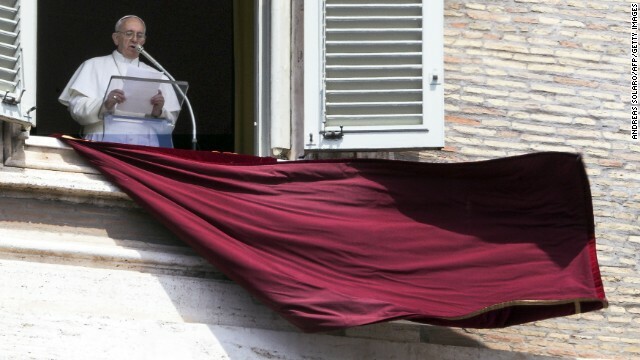 Pope Francis during his Sunday Angelus address at St. Peter's Square in April. In this document, he sets out an exciting new vision of how to be a church. In all my years as a Catholic, I cannot remember a papal document that was so thought-provoking, surprising and invigorating. Frankly, reading it thrilled me. First, why not look at things from a new perspective? Second, why not be open to doing things in a new way? And third, why not have a new vision for the church? (CNN) - Pope Francis on Tuesday called for big changes in the Roman Catholic Church - including at the very top - saying the church needs to rethink rules and customs that are no longer widely understood or effective for evangelizing. "I prefer a Church which is bruised, hurting and dirty because it has been out on the streets, rather than a Church which is unhealthy from being confined and from clinging to its own security," the Pope said in a major new statement. "I do not want a Church concerned with being at the center and then ends by being caught up in a web of obsessions and procedures," Francis added. The Pope's address, called an "apostolic exhortation," is part mission statement, part pep talk for the world's 1.5 billion Catholics. Francis' bold language and sweeping call for change are likely to surprise even those who've grown accustomed to his unconventional papacy.